I just saw the official trailer for Star Trek Discovery. I have been afraid they would mess it up somehow, but if the show is anything like the trailer, they are staying true to the original story. The first words spoken talks about Vulcan heritage and I thought at first “Wait, they’re doing Vulcans again?”. Then I realized, almost as soon as the thought came to my head, that obviously a storyline taking place before Kirk, and even Pike, embarked on their mission would deal mainly with the only members of the Federation at the time, Humans and Vulcans. It seems like they have picked and mixed from the previous shows, taken what has worked in the past. It does not look like we’ll get the action-packed mess that is the reboot films, but we’ll still get action. We won’t get the dragged-out borefest that was TNG, but we will get slow-paced moments. As the title suggests, the main focus will be exploration. And before you hang me, I do not personally think the reboots have too much action or that TNG has too little, those are the main complaints today’s viewers have of the shows. My only two complaints about the trailer is firstly the music. Instead of the bombastic orchestra from all the shows that have been well received, they’ve opted for a modern, slow ballad like the only show that wasn’t well received (Enterprise). The second complaint is the look of the Klingons. 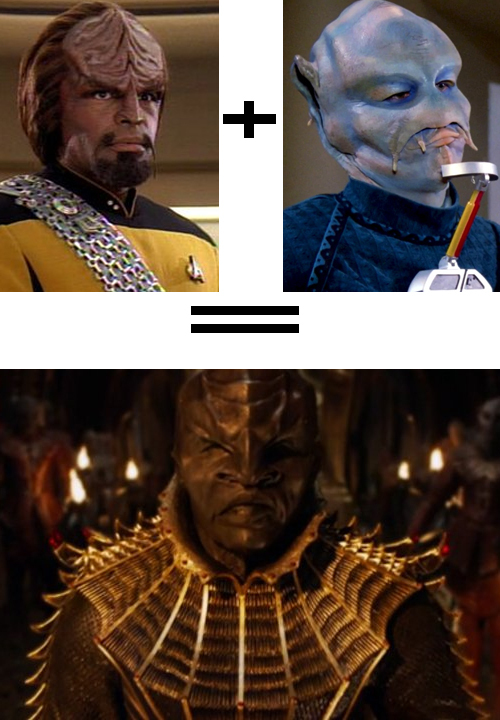 They’ve completely redesigned the Klingons for a third time. First redesign was in Star Trek III: The Search for Spock, where the previously Turk-looking band of space pirates were replaced with the warrior-like race with ridged foreheads. This design was by far the longest lasting. It was even explained in-canon by Worf, explaining that something triggered a genetic change in all Klingons, giving them the ridges. Second redesign was for Star Trek Into Darkness, where the hair was removed, the ridges converged on a central larger ridge going along the top of the head and meeting with the nose and half of them had piercings in this main ridge. This despite it taking place long before the aforementioned genetic trigger. So now we’re at the fourth incarnation of the race, even earlier on. Of course, as true as they seem to have stayed to the original story, these will be ridge-less, right? Nope. It’s a hybrid between the Next Generation Klingons and those of Into Darkness, hairless and with a main ridge going down the front. Except this time the forehead ridges look like it forms a sort of shield, similar to those of a Triceratops. The side of the ridges form horn-like structures at the top of this “shield” and a crease along the side of it, going along all the way down to the nostrils. This makes the lower half of the face look a lot like those of the Benzites. They also replaced the traditional sash with armor, but that may be a cultural shift, as the original Klingons did not wear the sashes either. Overall it feels like the show is going in the right direction, and all my worries have been calmed. I am looking forward to the first episode with great anticipation.